October 20, 2018 – Book Fair Signing- Melinda is the pre conference workshop presenter and is signing at the book fair (between 4:30pm – 5:30pm) during the 2018 Put Your Heart in a Book Conference hosted by the New Jersey Romance Writers. Signed books will be available to purchase at the event. The 2018 Conference will be held at the Renaissance Woodbridge Hotel, 515 Route 1 South, Iselin, NJ 08830. November 18, 2018 – Book Signing – Melinda will be signing books from 12:00 pm-1:00 pm at the Meet the Authors Book Fair in the Eau Gallie Civic Center during the Eau Gallie Fine Arts Festival, in Melbourne, Fla. Melinda will have books available for purchase, and she will also be glad to sign any books that people have already bought. September 21, 2019 Book Signing – Melinda will be signing books at the London (England) RARE event. Additional information to follow. So excited! What I’ve Done is #2 on the Wall Street Journal eBook list. Thank you everyone that bought the book! What I’ve Done, book 4 in the Morgan Dane series, is out this week and it went straight to number 2 in the kindle store on Day 1!!!!! Awesome and thank you to everyone that has read it! Her Last Goodbye debuted as the 34 Bestseller on the Wall Street Journal Fiction list!! So excited !! 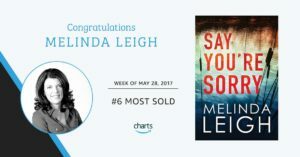 Say You’re Sorry is #6 in the Amazon Bestseller List! In a new series, former prosecutor Morgan Dane faces the most personal—and deadly—case of her lifetime. Book two, Her Last Goodbye, in the already best selling Morgan Dane novels is up for pre-order on Amazon.